Disclosure: The editor sent an electronic review copy for the purposes of this review. Right from the outset, my heart goes out to Panverse One. I don't consider novellas an endangered species, but it is quite rare to encounter them, and save for exceptions like PS Publishing, there's not a lot of publishers who are dedicated to the format. 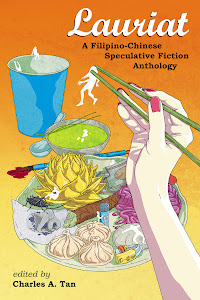 Having said that, publishing such an anthology is quite a risk: it's the first book by a new publisher, the editor is virtually unknown, and it's honestly all too easy to screw up writing a novella. Compound this with the fact that I don't know any of the contributors save for Uncle River and the layout artist. So how does Panverse One fare? Surprisingly, good. First off is the striking cover by Vitaly S. Alexius, which illustrates the first story in the book, "Waking the City" by Andrew Tisbert. Layout artist Janice Hardy is also invaluable as everything is elegant and neat, more on the side of the designer being invisible rather than overtly beautiful. As far as the stories go, they're what I classify good but not the best, save for "Delusion's Song" by Alan Smale, which actually might be one of this year's favorites. Don't misconstrue that assessment however as the stories being mediocre: they're strong and make good use of the format, although they aren't devoid of weaknesses. The first story is "Waking the City" and in many ways, it's a perfect fit to open the book. It's the most accessible in terms of language and readers get a clear idea what it's about from the get-go. It has this fantastical atmosphere backed up by science fictional rationalizations, although the subject matter towards the end of the story leans more towards the latter. Tisbert spends a good deal exploring his characters and while the plot is predictable and not groundbreaking, he does weave an interesting story where readers are eager to know what happens next. I found it to be an enjoyable piece although veteran readers of the genre won't find it to be spectacular. "Shiva Not Dancing" by Uncle River is simply fun and has an undercurrent of humor throughout the narrative. River makes good use of the novella format by having a huge cast and exploring each character's dilemmas in brief scenes. One of the strengths of the story is that right from the beginning, it has this trickster-story pitch and that the seemingly-disparate threads will all come together at the end. There's parody and social commentary here but what makes it all fit is how these elements are complemented by River's characterization (which in itself is a challenge considering everything that's going on). Much like "Waking the City", the story had its good moments, and it definitely rises above mediocrity, but I wouldn't call it the best of the best. Particularly memorable is "Delusion's Song" by Alan Smale. This is actually the longest piece in the book but in Smale's hands, the story doesn't feel dragging. The key to this is the scene breaks as Smale writes in short bursts. His characterization is also spot on, especially the way the female characters rise to prominence. In certain respects, it reminds me of the award-winning story "Pride and Prometheus", not just because of the genre mashing, but in terms of the quality of the writing. There's a lot going for "Delusion's Song", from its metafictional elements to the eerie atmosphere that it develops. Another credit to the author is that I'm actually not aware of the novel/history this story is based on, but by the time I read the end, I knew it was referencing something (and a quick Google search satiated my curiosity). If there's a novella that I'd nominate for an award, this would be up for consideration. "Fork You" by Reggie Lutz seems like it's aimed at a younger demographic and is part of a larger series. There's lots of light and funny moments, although I find it jarring when the author makes a reference to organizations like the CIA as it doesn't fit the Southern mood it was establishing. There's also a significant break in the story as the first half is quite tight while the latter half is a smorgasbord of various elements which include backstory and a drastic shift from our main character. It probably makes more sense when viewed from the context of Lutz's series but as a stand-alone story, it was entertaining but far from being elegant. "The Singer of Rhodes" by Jason K. Chapman is clearly a science fiction piece and maybe because of that fact, I didn't enjoy it as much as the others. There's an attempt at characterization but I wasn't really sold on the characters. There's some interesting dialogue between the protagonist and the friend he's trying to rescue but otherwise, the story feels too mediocre. On a positive note, the author doesn't hold back and a lot of mayhem that ensues despite the best of intentions. Still, personally, this story had the least impact on me. 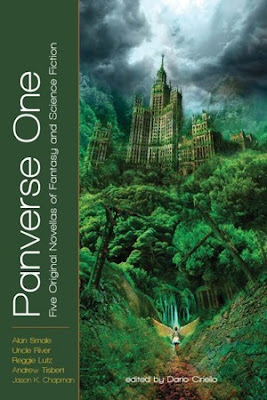 Panverse One is not only a brave undertaking but lives up to its boast. This anthology is about quality over quantity, and Ciriello somewhat delivers.